Use EssentialFax completely free for 30 days (fully functional, all features included). For your free 30 days, simply download and install the fax program, and try it out. Fax from all desktop versions of Windows 8, Windows 7, Windows Vista and Windows XP - and now Windows 10! Print from any Windows program to create faxes. Use your scanner to create faxes. Scan one or more pages and fax them. 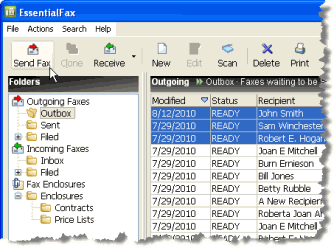 EssentialFax provides real faxing - with the security of a direct fax connection. Faxes go directly from you to the receiver with nothing in between. After testing it out free for 30 days, if you decide to keep it the cost is only $29.95. There are no extra fees or hidden charges. We send you a permanent key code that allows you to install and use the fax program on two computers.